A Hawaiian Chevrolet dealership setup a jacked-up Suburban to crush a vintage Honda Accord to send a message to anyone buying Japanese. The message became somewhat cluttered when the tiny Honda broke the SUV. 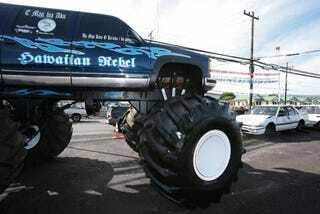 James Severtson, the general sales manager of Island Chevrolet in Hilo, Hawaii, hired a Chevrolet Suburban monster truck to drive over a used Honda Accord before a large crowd in order to highlight the importance and strength of American automakers. Instead, Severtson highlighted domestic quality issues when the truck blew a hydraulic hose and started leaking fluid after its first pass over the Accord. A few hours later the truck was repaired and the Accord, which proved to be too tough a competitor, was replaced with a Hyundai Excel. This time it went off without a hitch. Let that be a lesson to you. If at first you don't succeed go to the White House for help try, try again.